Norton legislator Temba Mliswa has hailed Minister of Health and Child care Obadiah Moyo for visiting the constituency to assess the area as the cholera hit parts of Harare. In a letter to the residents Mliswa said he continue to work towards fulfilling his election pledges and creating an enabling environment for development in Norton, and he was pleased by the recent visit to Norton by the Minister of Health & Child Care, Dr. Obadiah Moyo. "His visit follows the successful visit of the Minister of Industry & Commerce, Hon. 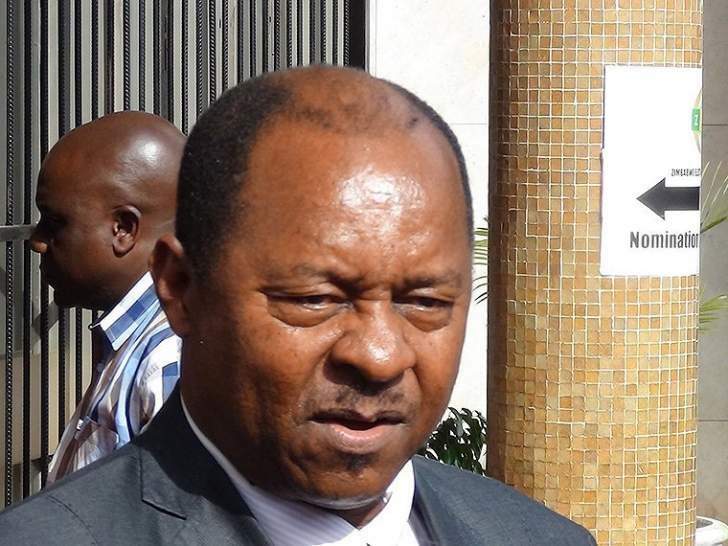 Nqobizitha Ndhlovu which was targeted at resuscitating Norton's industry, facilitating job creation and subsequently the community's overall prosperity" he said. "Norton Hospital has long laboured under the strain put on its facilities and services due to the growing population of the constituency. Whilst the staff have worked professionally and diligently under sometimes very tough conditions, the truth of the matter remains that Norton Hospital has outgrown its current status as a Council Hospital." He said there is an awkward staff situation at the Hospital where you find the doctors who are Government workers receiving their salaries but however the nurses under Council have not been paid, this is not sustainable and is a matter that urgently needs to be resolved. "The town requires facilities such as a radiology department, a surgical theatre, more ambulances etc. Long distances travelled to seek specialised treatments and services or to visit and care for ailing relatives and friends must be cut, and as such the upgrade from Council to District status is a necessity that is not debatable. The welcome development will see the hospital benefit from Government funding and an expansion in services and facilities," he said. "Councillors were democratically voted for, and that is good. I have never wanted to be involved in party affiliations but am more concerned with capacity and serving the people. Unfortunately it has been noted that some, not all, seem not to want to work together for the good of the people. Development will however continue with or without their involvement, it is entirely up to them to have a conscience and serve the people. On numerous occasions I have made fruitless attempts to communicate with errant Councillors and the evidence is available." He said the correspondence feedback or lack thereof, subsequently indicates who heeds and who turns a deaf ear. "If for one reason or another, those that ignore do not want to work together to achieve developmental goals, it will not be at the prejudice of the people. They have a mandate to adhere to their obligations in terms of section 274 of the Constitution, whilst I am governed by sections 117-119. Our roles are clearly defined and mine is to make sure that there is oversight over Council. Councillors there just for the allowances are not of the calibre Norton wants or deserves. Have they come to thank the people for voting for them and started to work in their wards? That for me is critical," he said. "There has been a lot of mismanagement and corruption slowly being unearthed at the Norton Town Council (NTC), and as you know I have previously articulated these suspicions which many people previously found hard to believe. Currently two Councillors have been arrested as well as the Director of Housing, Mutyambizi. Tendaupenyu has been suspended by the Town Secretary Kizito Muhomba and yet it is strange that Muhomba remains standing when all the approvals were made with his nod and he was involved in the payments made thereof." "He approved and purchased himself a motor vehicle for over $100,000.00 against an allocated budget of $70,000.00 that really should have been shelved looking at the precarious financial position of the NTC. Worse still, this extravagant purchase was made at expense of service delivery. The NTC Town Secretary must therefore explain the anomaly. Furthermore, why is it that Mutyambizi has not been suspended from work pending investigations to avoid evidence tampering? These are among issues that I have long brought to the fore." He said there is total mismanagement at the NTC and the only way Council can change is if Councillors devote time. "There is no way that we can logically expect a person with an 8-5 job to effectively run the Council part time especially when things are so critical. How can we hope to see improvement in such a scenario? The Chairperson should be based at the NTC, have an office, secretary and car there and be able to supervise operations full time to see that things run smoothly. Norton is a vast area and being dedicated and hands on is the only way the NTC can perform. As you all know, I have an open door policy and development remains my top priority. I have certain powers vested in me and I draw on these powers to perform effectively. I was not voted in because I work with councillors but because of my deeds, with development being my driving force," he said. "Norton, I stand by you all the way and we will bring about the change. Council we demand that systems be put in place. How do people pay where there are no systems? How is money accounted for? Where are people's statements? Where has the money been going? Councillors I am reiterating that you have a three month ultimatum to change the operations of the NTC with the first change that should be targeted towards Management. The Town Secretary and entire management team have let the people down and underperformed and as a result should be shown the exit door." Mliswa said new people with capacity who share the vision of developing Norton must subsequently replace them. "It is not good enough for the Town Secretary to plead to be new in the system as if so, we would have recorded visible changes by now. Anyway which system is he presiding over when there are not any in the first place? Money has been stolen from the people and I will soon be perusing legal action until Council justifies themselves. An audit conducted by the Auditor General must take place. I used to advise the previous Chairperson, Precious Mufahore, to be wary of Management and now look, today the same Management is the one instigating Councillors' arrests and Management are now turning state witness against them. It is now very apparent that the Town Secretary has played a game of divide and rule between Council and the Legislative in a ruse to create disharmony and suspicion to avoid the detection of alleged nefarious activities and dealings. Note this well Councillors. Let us continue with development and let Councillors work in their wards. I am dealing with the aspect of road rehabilitation using ZINARA funding. Money cannot and will not be released to companies that are not doing a good job. Performance is critical," he said. "I continue with my ward meetings, and last week held meetings in Wards 5, 7 & 11. I intend to continue with the programme as we go on the ground to ascertain the needs of the people. I will be having a NORDA meeting this morning, Saturday, 13th October 2018 at 10:00hrs at Dudley Hall Primary School to discuss new structures which will carry on with the development of the community. All are welcome to contribute on a voluntary basis and Councillors, as usual, are invited too invited and must not shy away as they will always be accorded their platform. On completion of all Ward meetings, I will formulate a proper people's way forward." "I am humbled to be reappointed as the Chairperson of the Parliamentary Portfolio Committee on Mines & Minerals and will do my upmost to ensure that the mining sector performs and meaningfully contributes to the country's Gross Domestic Product. I am cognisant of the mineral resources that we have in Norton and will push that the local sector performs productively and that GDI come in."